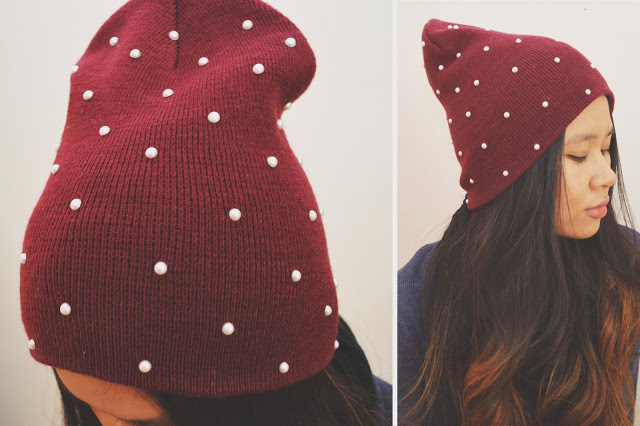 Equal parts edgy and sweet, I’m head over heels in love with this week’s DIY! 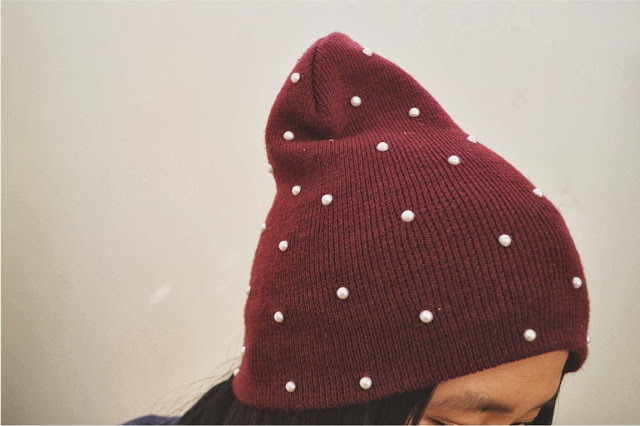 The pearl flat backs – which I found in the Scrapbook section of Michael’s – add a feminine touch to this maroon Men’s beanie I picked up at Target. Inspired by the classic vibe of pearl details, I knew I had to use them in a cool weather project. This is also another quick and easy one – ideal for a chilly weekend afternoon. Keep reading to see how I made it! 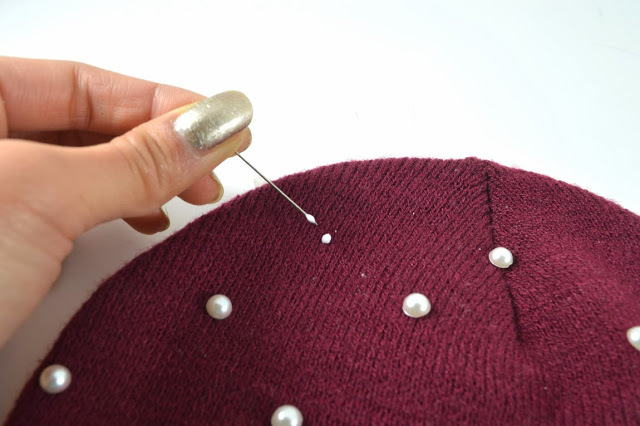 1) Lay the beanie on a flat surface and determine the placement of the flat back pearls. 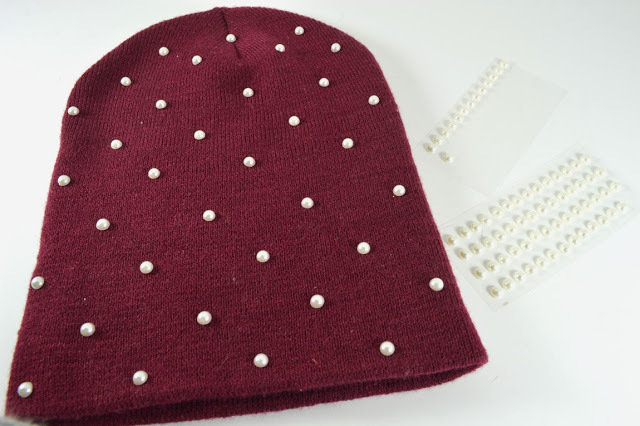 You’ll be working with one side of the beanie at a time.Flat back pearls from the scrapbook section will typically have an adhesive backing, but you’ll obviously need a much stronger bond. That’s where the fabric glue will come in. Note: I spaced the pearls about 1.75 inches apart. There was about 2 inches in between the “rows”. You can use a straight edge while determining each row, or you can just eyeball it! 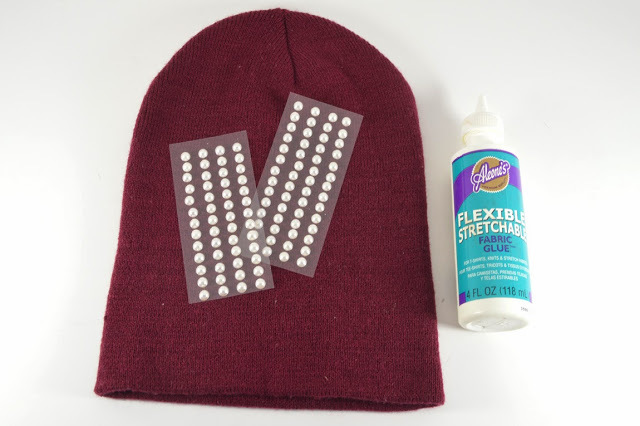 2) One by one, add a dot of fabric glue to the beanie. Repeat until the entire side is complete, then let dry completely. Repeat Steps 1 & 2 on the reverse side. Once that’s dry, you’re good to go. COPYRIGHT WILD AMOR ©. ALL RIGHTS RESERVED. Powered by Antonette - Premium WordPress Theme This work is licensed under a Creative Commons Attribution 4.0 International License.